Help children learn the letters of the alphabet by playing ABC Bingo! Print off the above template (including the Teacher's Mat and Cut Outs). Call out letters and have children place game markers on the letters that are called. Once a child has five in-a-row, they call out "ABC Bingo" and they are the winner! For more difficulty, call out the letters their "uppercase" or "lowercase" name. Once they have mastered letter identification, you can call out the letters by their sound! Purchase a checkers board (Wal-Mart) and place Velcro on the black squares on the game board. Print, laminate, and cut on the following squares on the above template and place corresponding Velcro pieces on the back. Place the letters of the alphabet (lowercase and uppercase letters) in random order on the game board. Each time a player moves a checker, they must say the letter and/or the sound that letter makes. 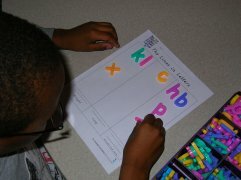 Providing children with opportunities to examine letters helps them recognize the special features of each letter. Print the above template on card stock, laminate, and cut out. Allow children to sort the letters by their visual characteristics; uppercase and lowercase letters, shape, size, length, curvy lines, straight lines, letters that extend below or above the base line, letters with tails and dots, etc. The blue mat above was purchased at a local craft store and grids were created by using masking tape. Keep a supply of familiar and empty food containers in your classroom. 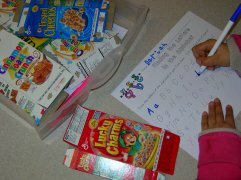 Have students highlight the letters that they find as they search these containers. Help children recognize the characteristics of letters. Laminate the above template and have children sort letters based upon the type of lines; straight, curvy, or both. Laminate the sorting mats. Using magnetic letters, have students sort the letters that are in their name and the letters that aren't in their name. 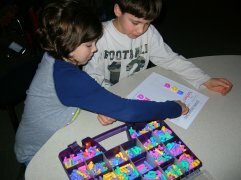 Children can also work with a friend to come up with the letters that are in both their names. Using empty water bottles, place in small letter beads (found at your local craft store) and mix with other various materials (sand, rocks, shapes, cotton balls, etc.). 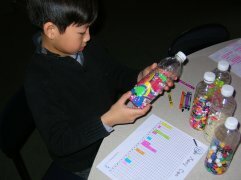 Children can graph the letters they find in the waters bottles using the above template. 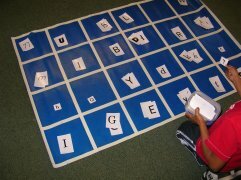 Print the bubble letters on card stock and have students decorate a letter with objects that begin with that sound. Laminate and cut out the above template. Lay the cards face-down and have students take turns trying to match uppercase and lowercase letters. Depending upon the needs of the child(ren) you may want to use only a few letters at a time. Having a set of magnetic letters readily available (uppercase and lowercase) is a must! 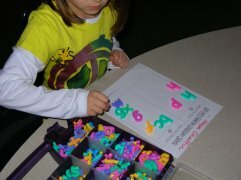 Early learners need opportunities to manipulate letters (see above "Printable Alphabet Activities"). Craft stores have many organizational containers for storing letters of the alphabet that are easy for young children to use! 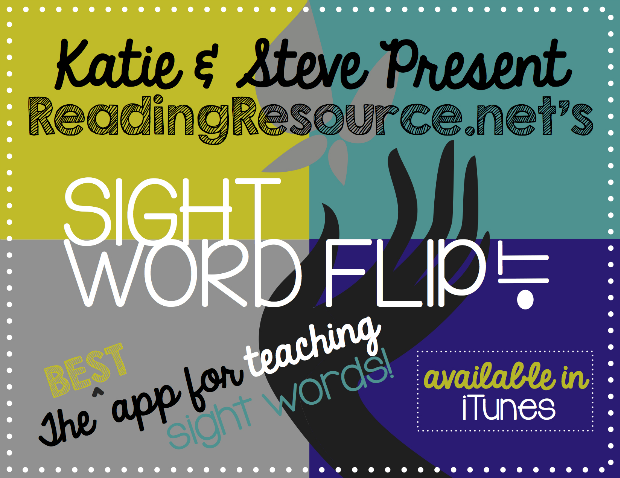 This activity is appropriate for students who have difficulty recognizing letters. 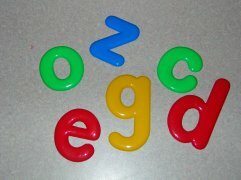 Using magnetic letters and board, place 3-4 letters at the top that your child knows and 1-2 letters at the top that your child has difficulty with. 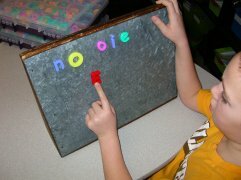 (For struggling learners, it's important that letters are directly in front of them and not down on the table). Give them verbal cues such as, "Pull down the lowercase a." or "Push up the uppercase f". Look out for letters that are different sizes and have different textures. 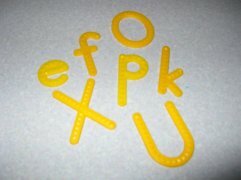 Many of these letters allow children to trace their fingers over and can help them learn the lines and curves. Lakeshore Learning is a great resource for stocking up on ABC materials! Write a letter that your child is learning to recognize/write as large as possible on a piece of paper. 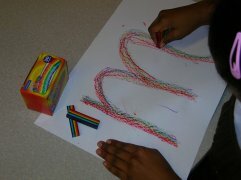 Show them the correct way to write this letter and have them trace over it with a rainbow crayon 5-10 times. Rainbow crayons can be purchased at almost any art store. If you can't find them, you can also have students trace over the letter with 5-10 different colored crayons! 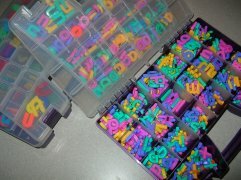 Lakeshore has many great ways for students to stamp the letters of the alphabet. 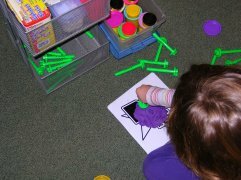 These Play-Doh Stamps are always a hit in the classroom. Lakeshore has an uppercase and lowercase set of these stamps!